Patterns are .pdf downloads. All pricing is in U.S. dollars. Questions? Visit the FAQs page or send an Email. 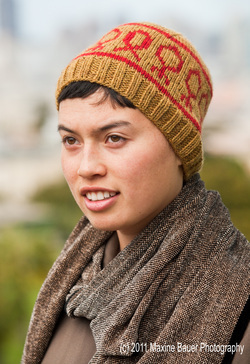 Inspired by the beautifully patterned hand-woven textiles seen during a visit to Southeast Asia, this pattern serves as a wonderful introduction to the world of Fair Isle or stranded knitting. The design features repeating diamonds that blend into a modified star at the crown. The colorwork focuses on high-contrast positive and negative shapes, while highlighting the variegated colors of Blue Moon Fiber Arts® Socks that Rock® heavyweight yarn. features a water border symbolizing the cycle of life and eternal renewal, and four stripes representing the four directions and the daily repeating cycle of life; reminding us that each day we are offered the opportunity to begin anew. 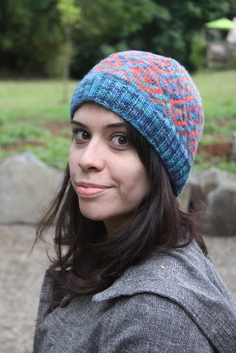 100% of the net proceeds from sale of this pattern are donated to Breast Cancer Connections. Make a bold move to show which cause is dear to you. Using this pattern, it's easy to create a custom hat supporting awareness of breast cancer, HIV/AIDS, or any other cause you choose by simply changing the color of the ribbons. 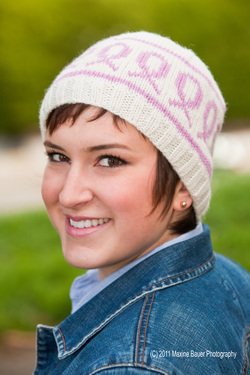 Knit one for yourself, make another for a friend or charity! 100% of the net proceeds from sale of this pattern are donated to Project Open Hand; a non-profit organization offering "meals with love" to people living with HIV/AIDS and other serious illnesses and to seniors in San Francisco and Alameda Counties since 1985. Learn more at http://www.openhand.org/. 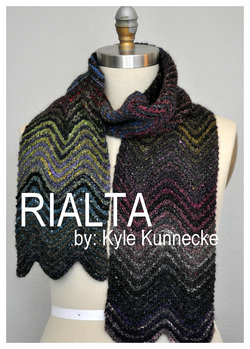 The Rialta scarf is an easy-to-knit, fun project that takes full advantage of the gorgeous color changes in Noro Silk Garden. Based on the ripple or wave stitch seen in many, many stitch libraries, this scarf is easy to make with one row of pattern followed by 3 rows of plain knitting heaven! Alternating between two skeins of delicious color-changing Noro makes for an unexpected treat. You'll find yourself knitting on projects like this for hours on end; working to see what color combination will be next!